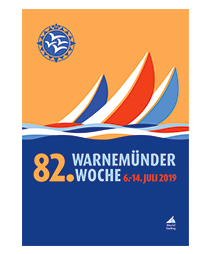 This regatta will be organized by the Warnemünder Segel Club. Sailors must first make an application on the Eurilca website and application will be final if they pay to the club before the entry is closed. If not late entry fees will apply. Sailors will connect on the club website to pay on line. Entry fees shall be transferred with reference made to class, sail number and sailor’s name to the following bank account latest one week prior the event. The OA operates RFID-based sign-out and sign-systems for security purposes for all competitors. A deposit of 5 Euros is to be paid at check-in on site for RFID-wrist bands. Due to the entry numbers the fleets may be split into groups, in which case colored ribbon bands will be provided at check-in for these classes. A deposit of 5 Euros shall be paid. All deposits will be refunded on returns. The sailing centre of Warnemünde is located approximately 230 kms north of Berlin and 10 kms north of the Hanseatic City of Rostock. Mostly western Winds with an average of 9 to 11 kn. Average Temperature of 20°C and water temperature of about 17°C. At the exit Rostock Ost (6) leave the A19 and the B105 towards Stralsund (signposted: Hohe Dune) turn. In Rövershagen at the first intersection, turn left to Niederhagen, right next to the spa route, turn into Hinrichshagen left and Markgrafenheide to Hohe Dune. Alternatively: Get as marina Mittelmole, but then through the Warnow tunnel (toll) or in Warnemünde by car ferry (chargeable) Translate into Hohe Dune. At the exit Rostock West (14) leave the A20 and turn onto the B103 towards Warnemünde. In Warnemünde signs to the marina Mittelmole follow. Warnemünde is also an arrival point for remote bus companies. No matter where, you always come low directly to your destination on the Baltic Sea. Rostock-Laage Airport (Taxi to Warnemünde about 60.00 euros). Until Rostock-Hauptbahnhof, take the S-Bahn to Warnemünde (terminus). Walk to the marina Mittelmole or ferry to Hohe Dune (2 min.). By ferry from Denmark, Sweden, Finland, Estonia and Latvia to the ferry port Rostock and from there to the respective port basis.